Feel Unique were kind enough to give me a voucher recently so I decided to treat myself to a few bits and thought I would show you! The first item on my wish list had been the Benefit Roller Lash mascara. I’ve had the mini tester for a while and I have been using it every day as I just love it. It makes my eyelashes look long, thick and curly…what could be better? Although I do find it expensive for a mascara, I think the packaging makes up for it. I love the cute chunky pink lid too. The next item that has been on my wish list for a while is theBalm Mary Lou Manizer Luminizer. Two of my favourites Alix and Estee are always raving about this so I couldn't wait to treat myself. I've used this once already and it is gorgeous; it's such a subtle shimmer as it doesn't have any glitter. I am in love with theBalm FratBoy blush so I definitely think the brand is becoming one of my favourites. Another Alix enabled purchase is the Bourjois ColorBand eyeshadow pencil in Brun Dadaiste. When she used this in a video I knew I had to get my hands on it. I actually have the Beige shade of this but I haven't been impressed with the colour pay off. I'm hoping this one will change my mind on the product though! The Origins GinZing moisturiser is actually a repurchase as this is an old favourite of mine. I used to use this so much but my pot started looking a bit sad so I stopped using it for a while. I like to use this in the mornings as it gives me a bit of kick and I love the refreshing feeling it gives. I also love the scent! The last product that I have been eyeing up for a while is the Rimmel Moisture Renew lipstick In Love With Ginger. This is another product that has done its blogging rounds but I finally decided to give it a go. I think this is probably better used more subtly and applied using the finger or a lip brush as I can imagine it would bleed quite badly if you were to apply it with the stick all over. I can't wait to start using this though. I hope you like seeing my latest purchases and let me know in the comments what beauty products you've been loving recently. Nice haul! You picked up interesting products. I love the Roller Lash (obviously,as thousands of other people do :P), and this range of Maybelline eye pencils is great! I like seeing new posts on your blog, it's always nice to read them! I adore the Origins moisturizer! 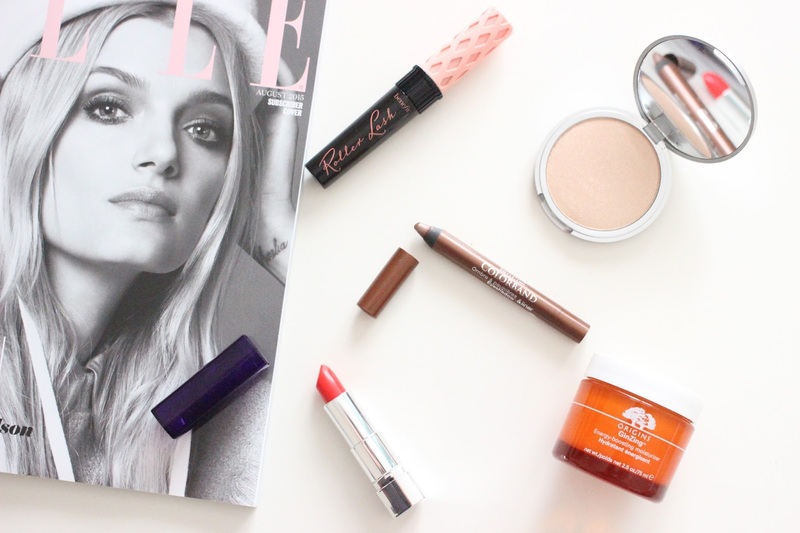 Great picks...Do you find the Rimmel lipstick has a smell? Kind of like a really strong smell of rotting flowers? I love Rimmel lipsticks but they smells absolutely gross to me! I must be in the minority of girls that hasn't tried roller lash! I've also been meaning to try the ginzing moisturiser and mary lou manizer for ages! The Rimmel Moisture Renew lipsticks are such an incredible formula! Love that Origins cream - it's so light and perfect for summer! Great picks! Really love Origins generally. I've been wanting to try rollerlash for ages! looks good!